The Ares core set has just been released and is now live on the site. You can check out all the recipes, boosts and get a complete item list from the Ares Core Set page here. Or load it straight into the Core Builder so you can get customizing with different gem combos. Click here to load the Ares Core set into the Core Builder. The Ares Core Set is a massive Cavalry Missile Set with huge attack boosts and debuffs. Alongside Zeus (Infantry) and Poseidon (Ranged) it forms a trio of high-power troop specific missiles. The overall power level is the highest we’ve seen, so no doubt some records are soon to be broken. It effectively replaces Frostbitten as the primary Cavalry attack set. 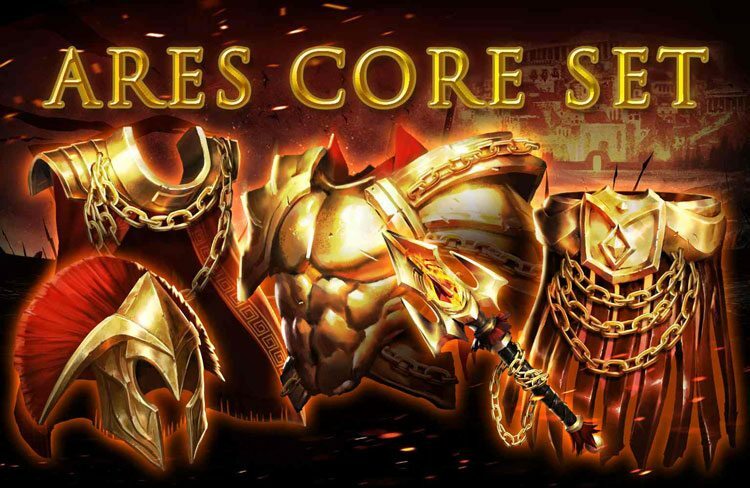 All the new Ares Cores and Pieces are here and on the Best Cores and Pieces Page here. From our observations and reports of Ares hits, we can confidently say Ares is the next-generation core suit that is the intended cavalry equivalent to Poseidon statistically. We had previously thought that the Frostbitten set was the first of this newest generation of cores (large debuffs to offset the exponential rise in power of defensive gear, combined with big attack values), but Ares far eclipses it as far as debuffs and combined Cavalry Attack/Troop Attack are concerned. Really everything, honestly. In terms of performance, expect results similar to those of the Poseidon core set. If you haven’t experienced Poseidon, when properly set up it’s sort of like Zeus times 2 (ballpark estimate off the top of my head), so you can expect similar results when using Ares. The debuffs on both sets are huge, and the Ares set, like the Poseidon set, has massive Troop Health Debuff and troop type Attack Debuff. The Troop Health Debuff will zero out most targets’ health, and the troop type Attack Debuff increases the likelihood of troops coming home (as in not losing the rally leader’s hero) so this makes the Ares set about as devastating as cores can get. FYI, the Troop Defense Debuff value above in the list of stats is deceptively low. 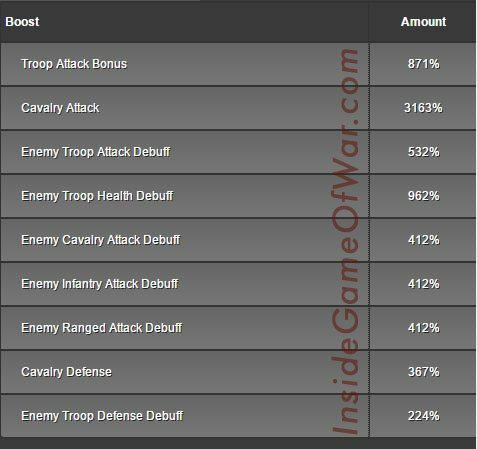 It ends up being dramatically higher once skilled and gemmed, and the full set bonus can add well over 400% overall Troop Defense Debuff, in addition to the typical counter troop type Defense Debuff. Ares and Poseidon (as well as Zeus when it is set up properly) hit hard, particularly if the rally leader in question has some or all of the newest research trees done (lowest branch of the Hero tree, Wild Traps, Wild/Strategic Siege). There are rather significant combat boosts stashed deep in the trees, so those additional boosts combined with the power of these newest missile cores mean you really need to be prepared to be hit by them. If your setup isn’t ready to go, don’t take a rally, especially if the rally leader is wearing Ares or Poseidon. Defensively, with this newest generation of cores it is wise to forgo bait gear, as even a solo hit from Ares or Poseidon in bait gear will cost you dearly (as will Zeus when set up well, don’t get me wrong. Zeus still hits hard). These newest-generation cores sets (Zeus, Poseidon, Ares) coupled with the new kill event scoring format that increased the point value of T2 troops during kill events means you may get hit more often at nearly any power, but it also means you need to have notifications on and combat gear on at all times when offline if you are a larger player that normally doesn’t shield. There is less downside to being aggressive than ever before, and target selection during kill events will continue to reflect this. Rally leaders wearing Ares or Poseidon won’t think twice about hitting 15b-20b power accounts in full Frostlord that they think are offline, and they’ll burn you quite handily unless you’re setup like a huge trap as far as troop totals go (large troop count). If you’re all T4, or only T3 and T4, they’ll make short work of you if you don’t get online fast, so consider this a friendly warning if that applies to you. You aren’t safe at any power if you log off in anything but combat gear, now more than ever before. This should go without saying, but we still see big guys getting zeroed in research or crafting all the time. If in doubt, shield. All that aside, the Ares set isn’t magic, and can be defended against successfully, as can Zeus and Poseidon. More on this and other defensive strategies soon. whats considered a large troop count?